John Enders, a local author, journalist and historian, has researched and written a coffee table-style book on the history of Lithia Park. 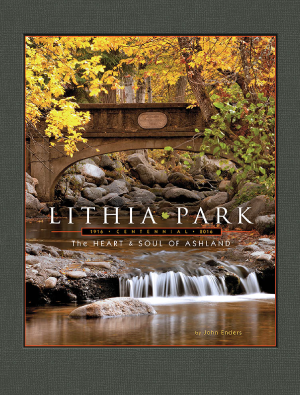 The book, Lithia Park: The Heart and Soul of Ashland, is sponsored by the Ashland Parks Foundation and features many historic photos, some dating back to the late 1800s, as well as a selection of modern-day photos generously donated by Ashland photographers. Lithia Park is a 100-acre jewel in Ashland that is loved by locals and tourists alike. For John, the park holds a special place in his heart: his great-grandfather, Henry Enders, served on the first Parks Commission. In the summer of 2016, the Ashland Parks & Recreation Commission (APRC) celebrated 100 years of Lithia Park! “It is so fitting that the release of the Lithia Park book coincides with the 100-year anniversary of the park. I would like to extend my appreciation and gratitude to the Ashland Parks Foundation for sponsoring the book; without the involvement of the Foundation this book might have not been possible,” stated Michael A. Black, APRC Director. Or purchase online via Amazon. The book is priced at $24.95 and proceeds will benefit the Ashland Parks Foundation. If you would like to make a donation to the Foundation, visit AshlandParksFoundation.com or call 541.488.5340.